Taking a hiatus from music for more than a year or two in this day and age almost feels like career suicide. It is all too easy to be instantly replaced by someone else, or to have an audience’s interest waver. Atwood Magazine published an entire editorial piece about Two Door Cinema Club’s return following a four-year-long absence, and if it actually matters. The conclusion? Probably not, if the artist proves that it was worth the wait. So then what happens if you’re an artist that not only has been absent for more than a few years, but the only thing you’ve released thus far has been a debut album? Let us ask this question in relation to Electric Guest, whose five year hiatus from music would raise a brow. On February 17, Electric Guest, the Los Angeles-based indie alt-electronic duo, released their first album in five years: the enchanting, glimmering sophomore effort, Plural (Interscope). Having only put out their debut album, Mondo, prior to this new release, Electric Guest (comprised of Asa Taccone and Matthew Compton) has decidedly jumped feet-first back into the music world. Jump first, fear later. But there is no fear needed. 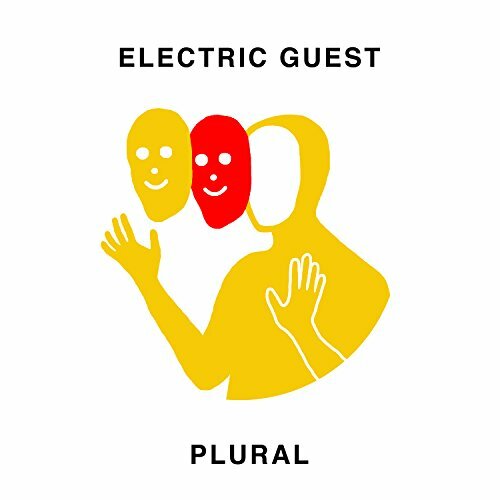 Plural is an electrifying, dreamy 11-track record that represents Electric Guest in the purest, most authentic iteration. They may have been away for five whole years, but it was certainly worth the wait. Plural is an amalgamation of inimitable sonic ingenuity and thoughtful lyrical one-liners. It charms its listeners from the start, opening with a hazy echo of vocals proclaiming, “Begin, begin…” on the album’s opener, “Zero.” “Zero” introduces the album’s theme outright: the idea that nothing is ever perfect, and can never be that way. It is appropriate as an album opener, and immediately lets the listener know what to expect. (Upon further examination of the lyrics, however, “Zero” could also be considered a tongue-in-cheek ruse from Electric Guest, acknowledging the supposed preconceived ideas that the public may have about them and their absence.) Through “Zero,” they are reclaiming their stake, both literally and figuratively, and instantly prove that Electric Guest and Plural should not be overlooked. The third track, “Back & Forth,” acts just as its title suggests. The narrator is fighting both an internal and external battle, trying to decide who he is, or who people want him to be — should he be who people want him to be? Does it matter to appease others for likeability? There is, quite legitimately, a “back & forth” battle between impressing others while still always being true to oneself. Following “Back & Forth” is “Dear to Me,” one of the album’s leading singles. The track showcases Taccone’s unique vocal prowess, and also includes backing vocals from HAIM. The song cycles through varying sounds, including a mix of raw and digitized vocals, as well as an ethereal blend of instrumentals and harmonies that consistently overlay the four-minute track. “Dear to Me” is a harmonious ode to a loved one, and the narrator proclaims that he will always have love for his subject. The song is subsequently followed by “Oh Devil,” however; yet another scathing jab that speaks of the toxicity within relationships. The song is an emphatic and upbeat track that shows off Electric Guest’s impressive technical abilities, as well as Taccone’s enrapturing, higher-pitched vocals, while still remaining true to the album’s continuing theme. In succession, these tracks are an affecting representation of what the duo is aiming to achieve through Plural: the constant duality of light and dark, of love and hate. “Back For Me,” the next track, feels rushed, yet careful. It is a calculated tempo that assuages its listener, but also makes one feel like they need to go. The song itself is a reflection on life, and always remembering to stay honest with oneself; it speaks to the inner and outer battles one often faces within relationships. After “Back For Me,” the album’s next track, “See The Light,” takes the self-reflective tone of the previous tracks, and projects it onto someone else as the narrator croons, “I’ve seen the light in you before.” It is a definitive shift in tone, but remains true to the album’s overall theme. Though “See The Light” presents a relatively positive image, its successor, “Over,” is a biting post-split anecdote, as the narrator reminds its subject that they have just been going backwards, and are not solving anything together. The narrator then accuses its subject that they “played a part / of the bleeding heart,” and goes on his way saying “over at last / only the best.” As the album continues, though, it shifts in tone again: “My Omen” speaks again about the aforementioned “light,” and finding it after being stuck in darkness. “My Omen” poises itself as hyper-aware and enlightened, and holds onto any possible thread of hope. Plural has many faces, but it is its singularity among its contemporaries that truly makes it an impressive indie nonpareil. Navigating life, love, and loss is a continuous battle within one’s own mind, and it is a theme oft tackled within music. Plural is constantly at war with itself: each track that follows the next seems inherently opposite from its predecessor. The duality of Plural subsequently curates a drawn out narrative of light and darkness, of love and hate. Electric Guest know what they want to say — or do they? They do. They definitely do. And it is entirely up to their listeners to figure out exactly what that is — if it’s anything concrete at all.